Hi there, friends… I’m Melissa from More Time 2 Teach and I’m so excited to be visiting today as a guest blogger for Minds in Bloom! 2. 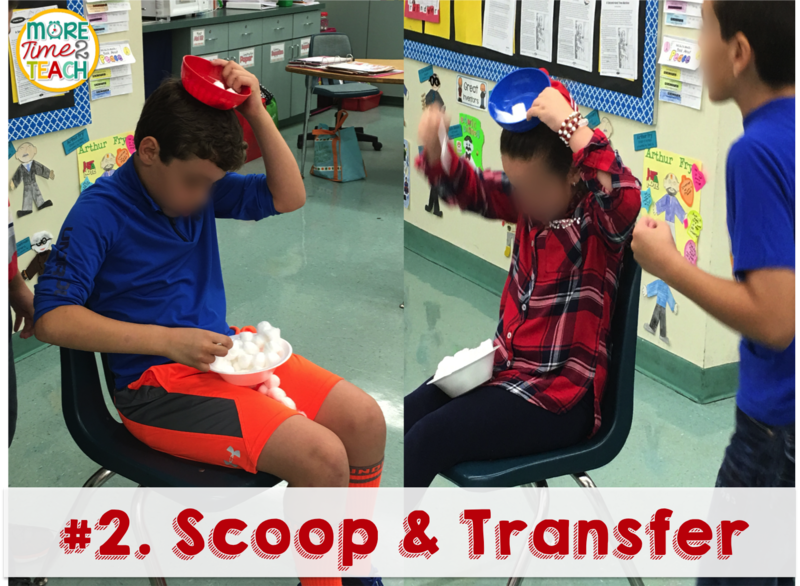 Scoop and Transfer- This game is great for sneaking in some teamwork practice! Materials Needed: bowls, spoons, and cotton balls. Instructions: Divide students into teams. Give each team 2 bowls, a spoon, and about 20 small cotton balls. To play, 1 student from each team sits in a chair with a bowl of about 20 cotton balls in their lap and an empty bowl on their head which they can hold onto. A fellow teammate stands next to them and will pick up any balls that fall on the floor and place them back in the bowl. 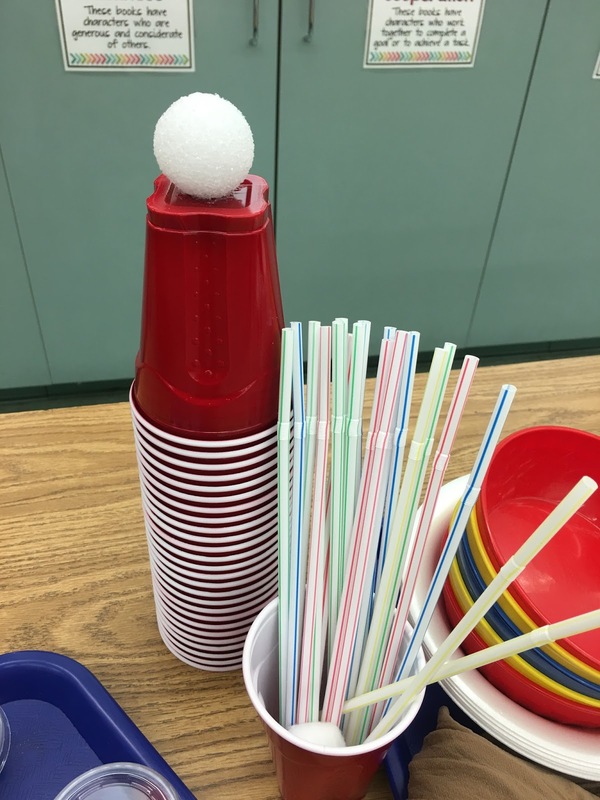 The goal of this game is for students to transfer a total of 5 cotton balls from their lap into the bowl on their head using only the spoon. They are only allowed to transfer 1 cotton ball at a time. Once 5 balls are in the bowl, the next team member sits down and starts all over again. The first team to have every team member complete the task wins this game. 4. 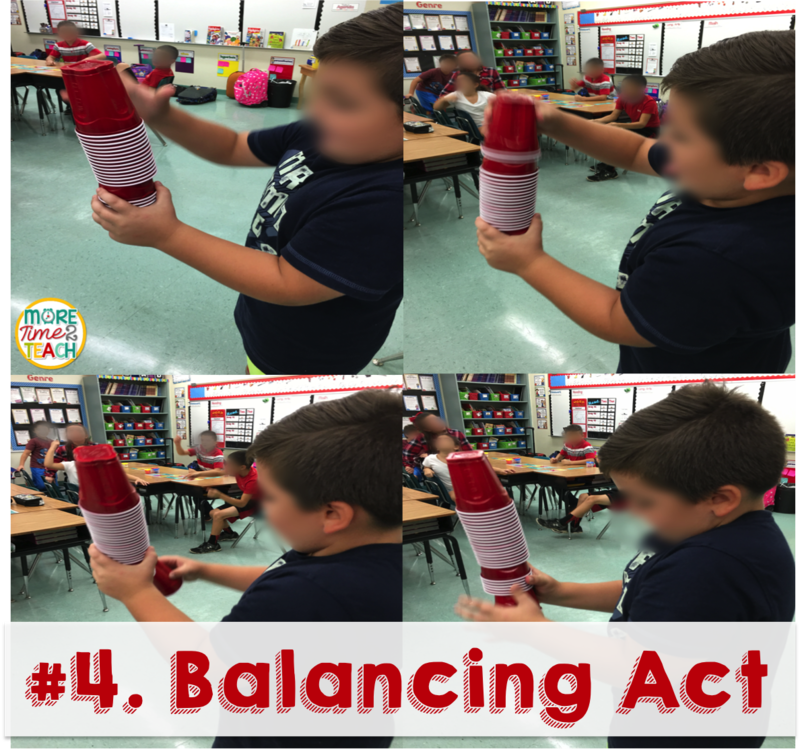 Balancing Act- This game was a little challenging at first. Especially since we used the squared off SOLO cups pictured on the right which tend to stick to each other. Despite the added challenge, my students had a blast! 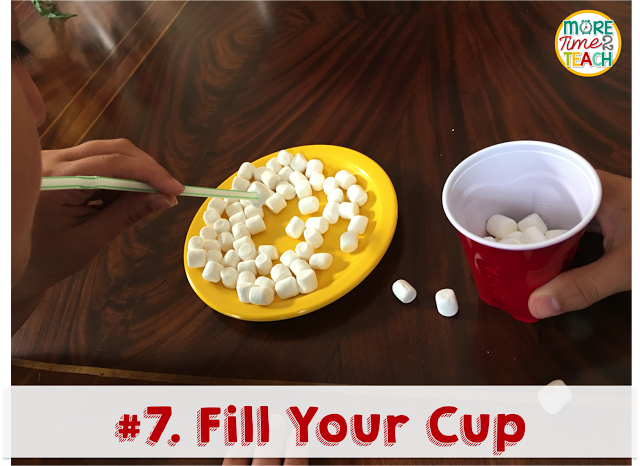 Instructions: Hot glue a small styrofoam ball to the top of one of the Solo cups and let it dry. Then stack the remaining 24 cups and add the cup with the ball to the top of your tower. 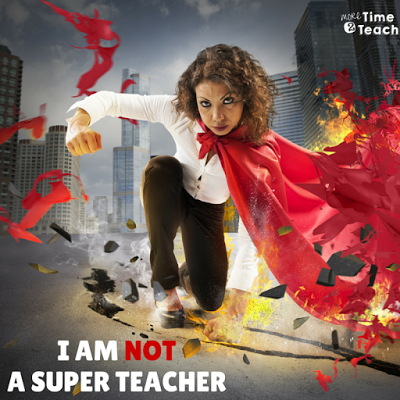 Divide students into teams. 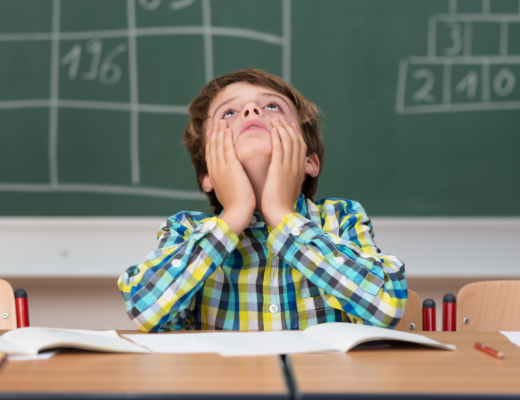 Give each student their tower. 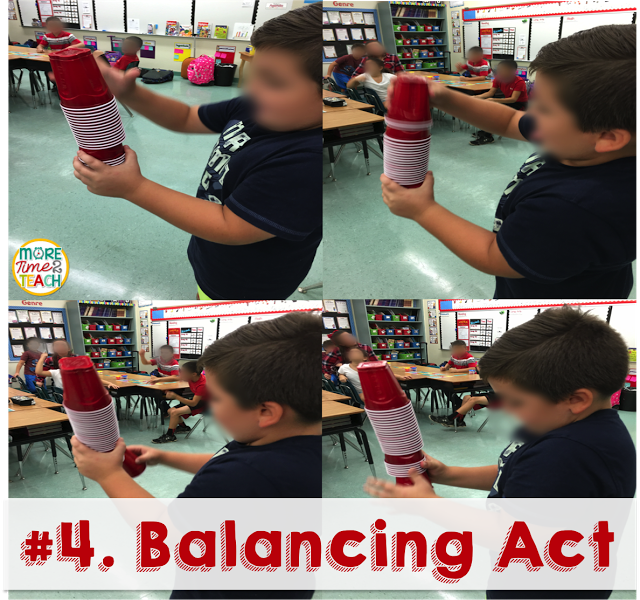 On “GO”, each team will begin moving cups, one at a time, from the top of the stack to the bottom. The first team to have the cup with the ball back on top of their stack is the winner. 5. 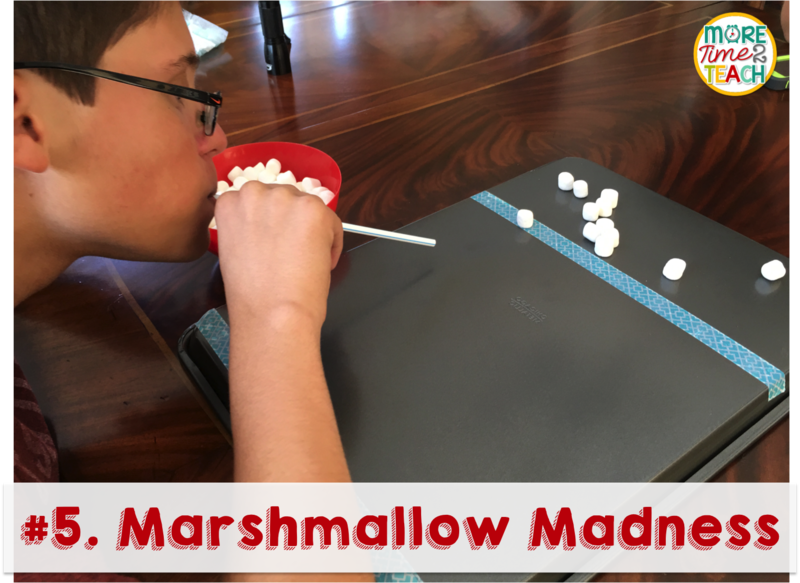 Marshmallow Madness- Let me begin by warning you that this game is addicting… Before you know it, you’ll be playing along with your students! Instructions: Using the tape, mark a start and finish line on your cookie sheet. Place a handful of marshmallows into the small bowl. When you give the command to begin, students will have 1 minute to blow as many marshmallows as possible from the starting line all the way across the finish line. Any marshmallows that fall off the cookie sheet do NOT count as a point. The team to successfully blow the most marshmallows across the finish line is the winner. 6. 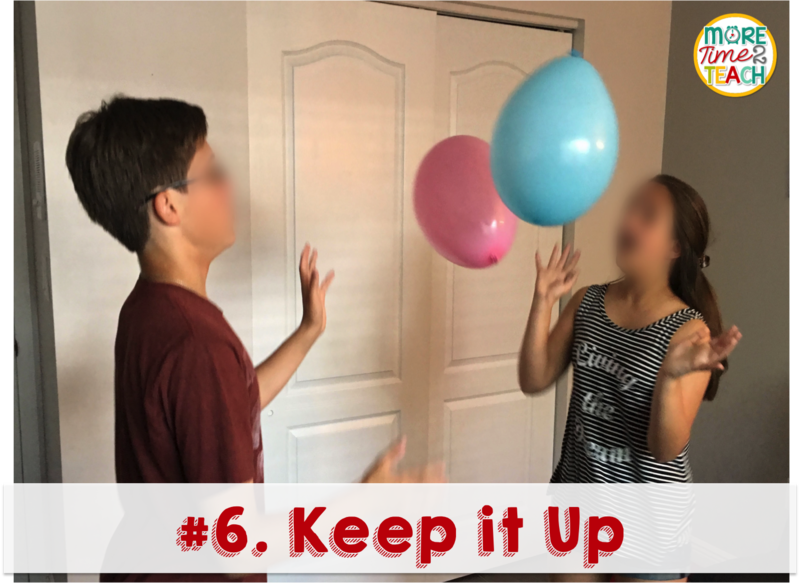 Keep It Up- Your students are probably already familiar with this game so you won’t need to do a lot of explaining. It’s also a definite kid pleaser… my own children have been playing it at home since they were little and NEVER seem to get tired of it. Instructions: Divide students into even numbered teams and have each person find a partner. If you have an odd number of students, just have 1 person go twice. Call up the first 2 players from each team and have them stand facing each other with a balloon in their hands. On your mark, they will begin tossing the balloons up into the air to each other. Their job is to keep BOTH balloons up in the air for a total of 1 minute. If they are able to do so, then they earn a point for their team. Continue until the entire team has played. The winner is the group with the highest score. 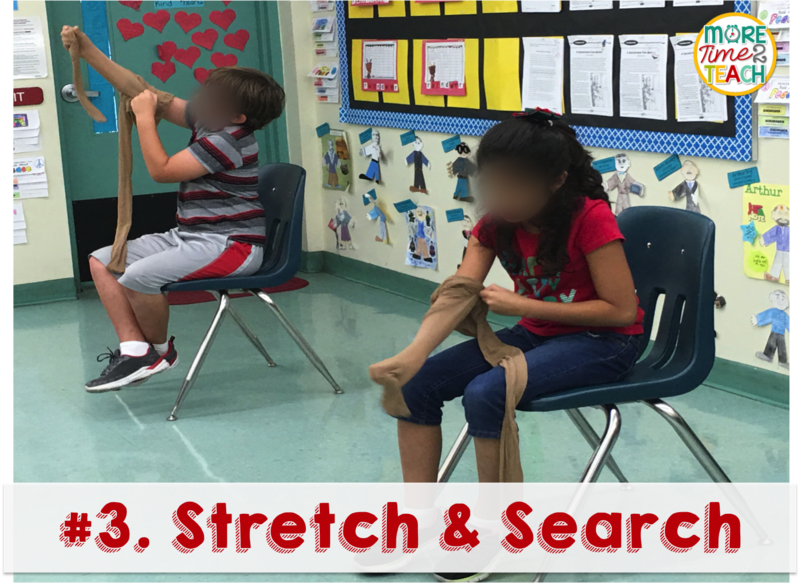 Instructions: Split your students up into teams. Give the first person from each team a plate with a handful of small marshmallows on it, a straw, and an empty cup. Have another team member assist them by holding the cup in place. 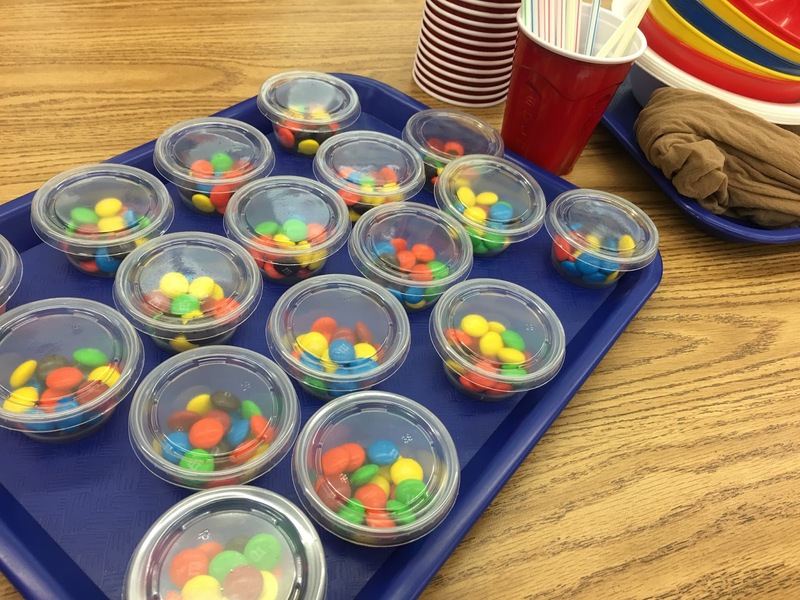 When you say “Go”, students will have 1 minute to transfer as many marshmallows as possible from the plate into the cup. 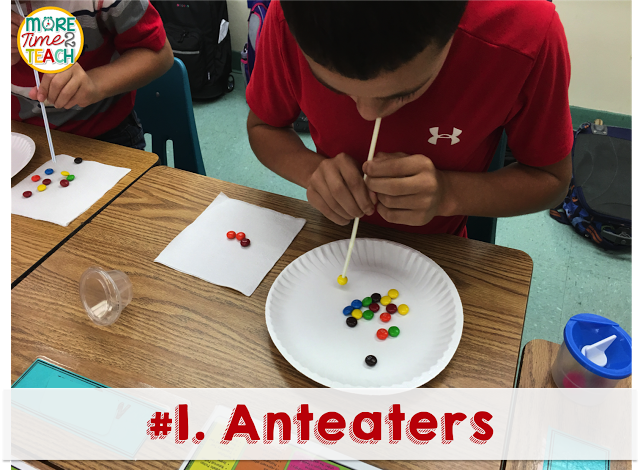 Once time is called, count up the treats transferred and award each team a point per marshmallow. Any marshmallows not inside the cup when time is up, do NOT count. 8. 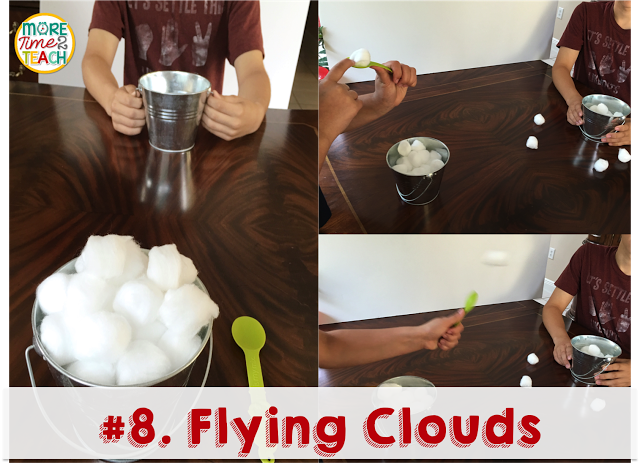 Flying Clouds- This game is as simple to set up as it is to play! Instructions: Divide students into teams and call the first 2 players up from each team. Have them sit across from each other. Place a bucket filled with cotton balls and a spoon in front of one of the players and hand the other person an empty bucket. On your mark, player 1 uses the spoon to fling one cotton ball at a time into the empty bucket. 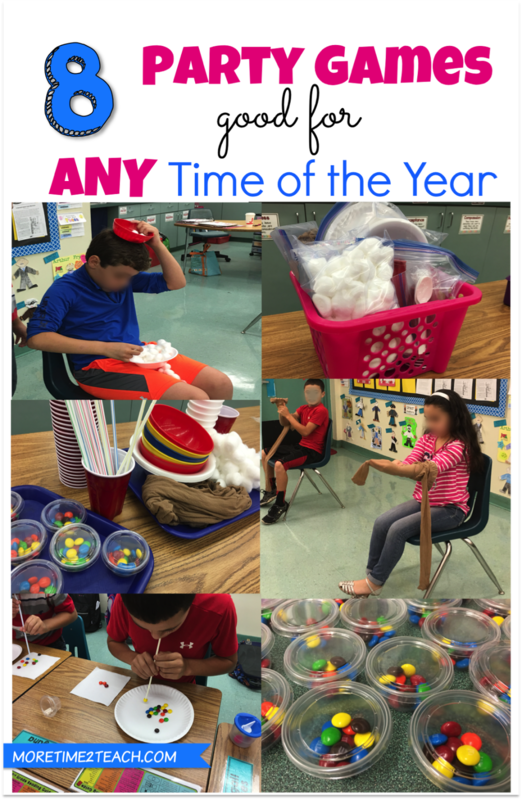 The goal is to try to score as many cotton balls into the bucket as possible before time is called. Each ball that manages to stay inside the bucket scores a point for the team. Continue to play until every team member has had a chance to play. The winner is the team with the most points. I’d also love to connect with you… Click the social media links below to find me on Instagram, visit my TpT store, connect with me on Facebook, and read more on my blog.